Ride the Pink Horse is all about atmosphere. You see the whole setting and the characters in black and white as you read. You can smell the sweat and you can feel the heat. Along with the sweat and the heat, the feeling of anxiety, helplessness, and despair are palpable. 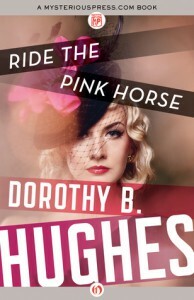 I’d never read anything by Dorothy B. Hughes before, but this story shows her to be a master of the noir genre. My highest compliment to a book is that you are there while reading it and this one puts you there. It wouldn’t have worked anywhere but in the time and place that Hughes put it. The setting, a fiesta in New Mexico, is as clear as if you were watching it on television. The reader is deeply inside the head of the protagonist, a petty thief from Chicago. You find yourself feeling anxious along with him and hoping for the downfall of the crime boss (a senator) that he is pursuing. This book is of its time and there are some racist passages so read it with the understanding that it was published in 1946. This book was provided by Netgalley which does not affect my honest review and rating of it.